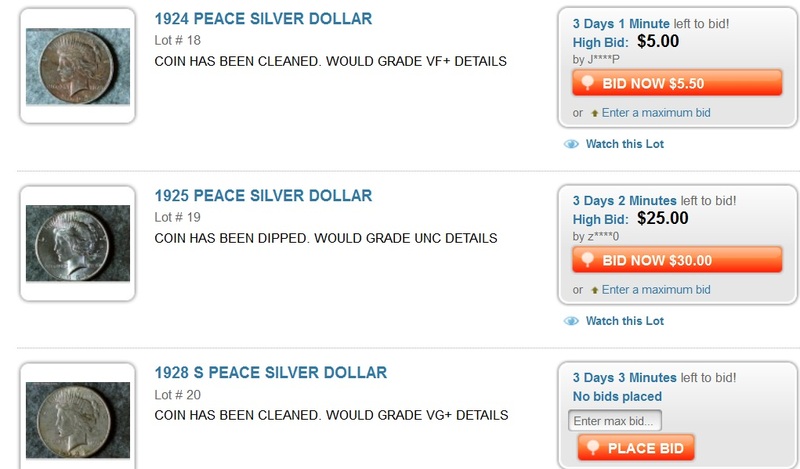 Liberty Shops Auctions is offering regular timed coin auctions with accurate lot descriptions, 8% online buyer’s premium and free shipping with coins sent within two days of auction. Liberty is one of the new coin specialists auctioning items on Proxibid. Terms are reminiscent of an eBay seller. Good selection of lots with some auctions like this one featuring budget items and others, pricey coins. We’re impressed with accurate numismatic lot descriptions, such as these examples noting dipping, cleaning and other problematic condition issues. (Click picture to expand.) . We anticipate more coin companies migrating to Proxibid, generating competition. Southwest Bullion has the lowest BP on the portal with zero percent, APN clearance and inexpensive quick shipping. This entry was posted in Best Practices, News and tagged American Numismatic Association, Auctioneers, AuctionZip, Best Practices, Coin Auction, iCollector, liberty shops auctions, National Auctioneer Association, Proxibid, Proxiblog, Southwest Bullion. Bookmark the permalink.